Within a space category's booking limits, you can also limit how many days in advance users can book spaces in that category. Under the Manage Locations tab, find the location containing the category you want to move and click on its link in the Spaces column. Click on the category's Edit Category button. Click on the Booking Limits tab. In the Window Limit field, enter how many days in the future users can browse availability times and book spaces. This is a rolling value that is exclusive of the current day. For example, a value of 1 would limit the booking window to the following day. This only applies to the public booking pages. 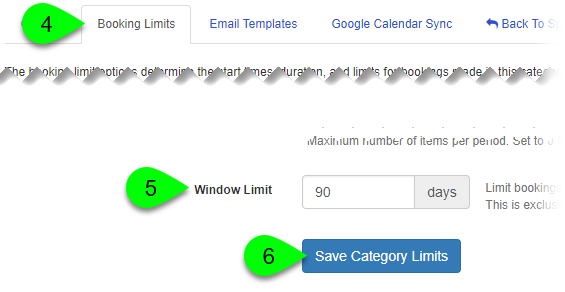 Staff users can override this limit when adding bookings under Spaces > Availability. Click the Save Category Limits button.